The origins of book printing in Slovakia may be traced back to the activities of an anonymous Bratislava printer known as Typographus Confessionalis in the late 15th century. From his output there have survived four printed works dating back to the years 1477-1480. A second printing house is also known to have operated in Slovak territory during the 15th century but no information about it has survived. 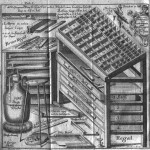 During the early years of the 16th century the development of Slovak book printing was characterised by activities of ‘migrating’ or ‘travelling’ book printers, who continually moved their equipment from town to town in order to avoid repressive interventions which would have threatened their printing activities. However, by the last third of the 16th century fixed workshops had been established in Trnava (1577), Bardejov (1577, 1597), Banská Bystrica (1577) and Bratislava (1594). Comparatively fewer written documents have been preserved relating to the sale and distribution of printed materials. From the end of the 15th century these activities were performed not only by domestic workers but also by wandering sellers referred to as Buchführer. These merchants spread books from foreign markets into Slovak territory, taking a fixed percentage of the sale price. Books were imported mainly from German but also from Polish cities. Some of these merchants worked exclusively for bookbinders and book-printers, while others offered other goods in addition to books. During the 17th century the development of professional book printing and the book market was impacted upon by various factors, including the Counter Reformation, the ongoing Catholic Revival, Black Death epidemics and anti-Habsburg uprisings. An important role was taken by the Archbishop of Trnava (from 1609) and subsequently by the Trnava Academic Printing House. As the institutional book printer administered by the Jesuit order, the Academic Printing House (1640-1773) served the needs of the Catholic Church in the process of the Catholic Revival as well as the educational requirements of the University of Trnava (founded in 1635). It published its own book catalogues to promote its production and became one of the leading printers of the 17th century. Other important printers during this period included ‘exile’ printers (Trenčín, 1637 and Žilina, 1665). The major part of their production took the form of works in then non-codified Slovak. Book printing also spread to other Slovak towns during this period (Košice 1610, Levoča 1614, Senica 1636, Mliečno 1637, Šamorín 1650, Prešov 1656 and Skalica 1656). An important role was played by the printing house of the Breuer family in Levoča, where works by Juraj Tranovský and Ján Amos Komenský were published. During the same period ongoing efforts to achieve a Catholic Revival resulted in the gradual stagnation and disappearance of important Protestant book printers. However, the needs of the Protestant religions continued to be largely met by importing the relevant literature from foreign markets. Reform activities in various sectors of society took place particularly in the Theresian (1740-1780) and Josephinian (1780-1790) periods. During this period the conditions were created for the further development of the book trade and an increase of the number of operating printers. In addition to the existing printing houses (Levoča, Žilina, Púchov and Bardejov) which continued their activities from the previous century and the institutional printers attached to the church (the printing houses operating at the Jesuit universities in Trnava and Košice), more modern printing houses were also established in Bratislava, Banská Bystrica, Banská Štiavnica, Komárno, Košice, Levoča, Trnava, Prešov, Skalica and Trnava. The ruling authorities also intensified their efforts to control the book market, implementing reform of the censorship process and imposing limitations on the influence of the church over the printing sector. In 1772 legislation was passed revising the activities of booksellers in the Hungarian kingdom. Throughout the 18th century the output of Slovak printing houses continued to be dominated by the production of religious works (the Bible, professional theological works, polemical literature or practical theology) as well as by the printing of literature for wide population groups (calendars, textbooks, occasional printings, fair printings etc). However, the spectrum of interest was gradually penetrated by the ideas of western Enlightenment. These activities were supported by the establishment of learned societies and by their efforts to develop scientific research. Book titles of a popular, educational, professional and scientific nature were increasingly represented on the book market. While official and scientific works continued to be published mainly in Latin, Josephinian reforms from the 1780s brought a large increase of German-language publishing, as well as stronger efforts to publish works in national languages. Where the Slovak national language was concerned, these attempts were reflected in the publishing activities of the Slovak Learned Society (Slovenské učené tovaryšstvo), established in 1792. Bookstores and book printers supplemented the gaps in the domestic printed production by offering imported scientific literature and belles lettres, mostly from German book fairs and large book-printing centres. Reading material was made available not only through fixed bookstores, but also through doorstep selling and selling at fairs, markets or bookbinders. During this period clergymen and the intelligentsia (teachers and students) played a significant role in the distribution of literature and the development of a periodical press. After the Academic Printing House moved from Trnava to Budín (1777, 1798) Bratislava emerged as the centre of the book trade, with several Austrian and German booksellers setting up shop there. In 1781 the first Lesekabinett or reading room on the territory of the Hungarian kingdom was established in Bratislava within the premises of a bookseller, who offered the possibility of studying or borrowing books and periodicals for a fixed fee. This example was later followed by other Hungarian cities. In the early days publishing, book printing, book selling and book binding activities were closely linked and often united under the leadership of one entity. 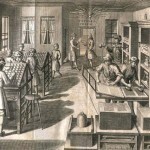 In addition to their important cultural function, book printers and bookshops fulfilled the economic expectations of their owners and the book trade became a profitable business. In the years which followed these activities were gradually developed, differentiated and closely specialised in order to meet the increasingly diverse needs of customers.